“The E-Fan X is an important next step in our goal of making electric flight a reality in the foreseeable future. The lessons we learned from a long history of electric flight demonstrators, starting with the Cri-Cri, including the e-Genius, E-Star, and culminating most recently with the E-Fan 1.2, as well as the fruits of the E-Aircraft Systems House collaboration with Siemens, will pave the way to a hybrid single-aisle commercial aircraft that is safe, efficient, and cost-effective,” said Paul Eremenko, Airbus’ Chief Technology Officer. The E-Fan X demonstrator will explore the challenges of high-power propulsion systems, such as thermal effects, electric thrust management, altitude and dynamic effects on electric systems and electromagnetic compatibility issues. The objective is to push and mature the technology, performance, safety and reliability enabling quick progress on the hybrid electric technology. The program also aims at establishing the requirements for future certification of electrically powered aircraft while training a new generation of designers and engineers to bring hybrid-electric commercial aircraft one step closer to reality. Paul Stein, Rolls-Royce, Chief Technology Officer, said: “The E-Fan X enables us to build on our wealth of electrical expertise to revolutionize flight and welcome in the third generation of aviation. This is an exciting time for us as this technological advancement will result in Rolls-Royce creating the world’s most powerful flying generator. Among the top challenges for the aviation sector is to move towards a means of transport with improved environmental performance that is more efficient and less reliant on fossil fuels. 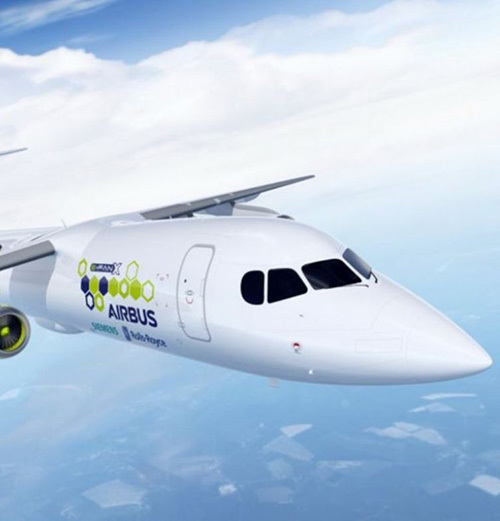 Therefore, Airbus, Rolls-Royce and Siemens are investing in and focusing research work in different technology areas including electrification. Electric and hybrid-electric propulsion are seen today among the most promising technologies for these challenges.